So to begin… as this is a PERSONAL eBay routine I’m talking about, I use eBay.co.uk to do my eBay-ing and expand to doing European and Worldwide searches because whilst eBay.com yields more results, when you find out sellers don’t ship to your country, it’s a little crushing and frankly, I’m not about to beg random people to ‘Puuuur-leeeeease’ ship to the UK so I’ll stick to eBay.co.uk for the time being. I’ll cut to the chase and say that of course my reason for eBay-ing is to score designer stuff for cheapie prices. 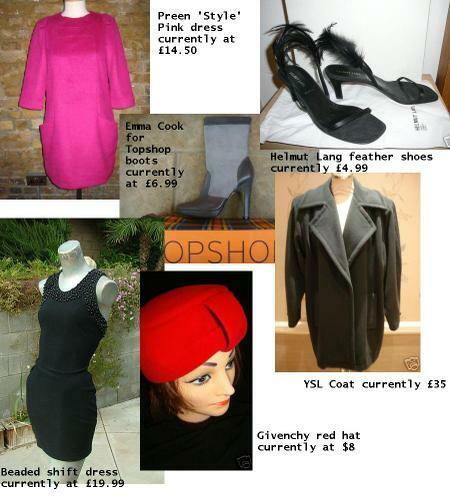 Vintage/highstreet/misc finds are what come along the way but if we’re talking about the specific search list that I run through on a day to day basis, then yes, I am typing in Hussein Chalayan, Ann Demeulemeester, Balenciaga, Givenchy, Lanvin, Preen and the list goes on (insert your own list of favourite designers). The good thing about you typing in a designer is that eBay will pick up on a similar ilk of designers under the search box and you could just go on clicking and clicking to your heart’s content. I don’t like to set size/price/colour/garment limitations on my searches because I like to see what is the entire availability and I ALWAYS ALWAYS set the search to Worldwide. Yeah, you may have to fork out for the shipping (though I find that US shipping is far more forgiving than one would think… Royal Mail just like to inflate everything…. ), but the gems that you miss out on if you stick to just searching within the UK (who are far-less profilific in listing items)…. it gives me a lot to browse for. However, when a name like Marc Jacobs is yielding 4,064 results, then I might put my foot down and impose a ¬£30 maximum bid price. In any case, I’m not likely to want to pay more for what are likely to be fakes. Yes….the dreaded China/Hong Kong factory surplus stock that clogs up eBay searches. I can’t really distinguish between the fakes and the genuine stuff especially when it comes to Marc by Marc Jacobs clothing. To be honest, I’m not fussed either way because the clothing is so H&M-ish that I often dismiss most of it and not to get excited about bidding for it. I’m not a fan but hey if you get it at the right price, a cute dress is a cute dress wherever it comes from. An annoying feature of the different eBay country sites though is that if you narrow your search down to say Women’s Clothing, you quite often miss out on listings that aren’t listed in any of the UK-specific categories (this especially happens with European listings) so if you were searching for something with a lot of beauty/cosmetics listings like Givenchy, sometimes you do have to trawl through a lot of unwanted crap to get to the good stuff. 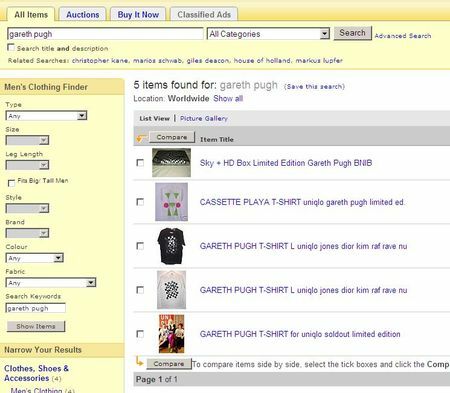 Now are you seeing that basically I have no life because of this laborious eBay routine but what can I say? I’m an addict… It gets even more labour-intensive when you click the option to ‘Search title and description’. I have triumphed with this awesome way of unearthing finds that aren’t designer but the seller is helpful enough to say something along the lines ‘This skirt is SOOOOO Prada AW07-8’ which means it’s not in fact a bit of tat but a bargainous nod to said designer. This is especially useful when you search in the Vintage category as of course, so many vintage items do nod towards what’s going on today on the catwalks. For example, searching for Gareth Pugh yields about 9 things that aren’t altogether very interesting but tick that little box and a stunner of a caped leather coat comes up that nods VERY heavily towards Pugh’s SS08 version. This is similar to the mispelt designer label that SOMETIMES works but more often than not, the item with a mispelt ‘Chanele’ is a bit of a duff. This isn’t a search tactic I use that often. The ‘No pic’ mint is a little annoying. Some person here hasn’t put up a picture to describe his/her ‘Ruby Red Dress in Style of Christopher Kane’. Who knows why but I wouldn’t ignore it as someone who is saavy enough to describe the item like that might be holding onto a real look-alike so I would badger this seller for pics by emailing them. If you clock a stash of designer bargains with no reserve prices, check what else that seller is selling and tag them as a favourite seller. I quite often forget to do this and thus miss out on a lot of plum listings. I have no idea what her eBay name is but a stylist from Paris was selling catwalk sample Galliano shoes, Lanvin two season-old dresses and skirts with NR with a lot of the stuff going for less than 100 euros. I can’t for the life of me remember her damn eBay name sadly…. The other long winded search method I like to run through especially in the Vintage section is for embellishments that I particularly like… for example… ‘large gems’, ‘pleated’, ‘leather’, ‘sheer’, ‘quilted’… this is especially fun on a grey/non-happening day. I was being serious when I said that this is labour intensive…. So you’ve added a ton of items to your watch list (there used to be a limit as to how many you could add but I believe they have removed this for addicts such as myself…). People always want to know how you actually nab them. Yes, there are sniper sites that do the hard work for you but alas, I do it the hard way and watch all the items with eagle-eyes, setting alarms on my phone and my computer to remind me to watch them. On occasion, if I’m out and about, I have even *hangs head in shame* called my sister up to get hr to bid on my behalf. I like to think that the eBay packages that arrive at my office are hard-earned fruits of my intensive labour. You probably will all disagree but it is a perverse attraction to watching the auction count down to the very last second and pressing the refresh button over and over again to check whether my final bid has been outbid or not, as my heart is beating incredibly fast. As more people are getting increasingly clever at the whole eBay thing, there is no way round it but persistence. 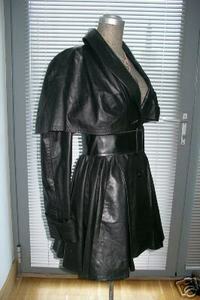 You want that vintage Balenciaga dress? Put some graft into it! What I will say though is I don’t pay EVER pay silly prices. I know my limits and I’m a bit of a ball-buster when it comes to prices. I feel like I’m getting ripped off if I end up paying over-the-top Topshop/Kurt Geiger prices for stuff. So my scores have always been very frugal. The bargains keep me hooked after all so if I did let go and went beserk in a bidding frenzy, for me, eBay would be a bit of a waste of time. I have yet to calculate what percentage eBay-ed finds take up in my wardrobe but it’s certainly a good chunk and yes, by all means, call me sad/tragic but the for me it’s a worthwhile fashion-procuring hobby (though I am moving onto furniture buying on eBay…god help me!). Susie, this is an incredible tutorial. You’ve put a lot of work into this and it’s a tremendous resource. I’d also like to add that often auctions that end in the middle of the night are the ones where you can find a good bargain. I was hunting some Murad cream that retails for about 50 quid and voila..auction ended at 3 A. M. and I got it for ten quid plus shipping. The most valuable piece of advice you listed–and one that many do not know–is to search the descriptions. There is no standardized method of listing information, so it is impossible to guess where it will appear. Furniture is another thing entirely! oooh! the beaded shift dress is gorgeous!! That was an amazing tutorial, Susie- thanks! so now i can be on my way to being a little fashionsta! Good tutorial, I’d just like to add my 2 cents. There is a website that specialises in searching allll the possible typos that thick ebay sellers may have made when listing a product. I have a tip for anyone that uses RSS feed readers. You can subscribe to ebay searches the same way you can subscribe to blogs. 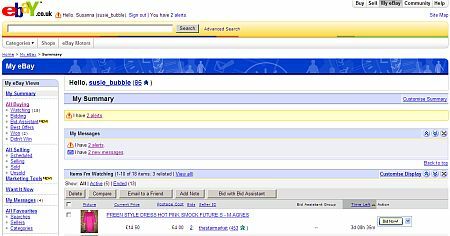 You can subscribe to specific searches too, with size and price limits etc.. You can also subscribe to your favorite sellers. Just look for the RSS button at the bottom of the search page. I swear, this has changed my ebay life! Thanks for sending your thanks! I knew you guys would come up with additional tips so hopefully the post as a whole including comments will be a good resource for anyone just getting into eBay. 5avenuemarceau: Nice score on the coat! you do realize that by helping us out we are probably going to bid against you!! =) I hate losing eBay auctions. Ruins my day. Especially when I am outbid by .50. In my opinion the number one band on the planet, its music, its history, its deployment scenario, the quality of its performances, this good blog. I love eBay…it ia great!! I have made great and bad experience with ebay. You have to be careful from who you are buying. To make sure to get what you have ordered you should make some research on the people that sell. These are GREAT statistics. Thanks for sharing your findings!!! These collections are works of art in digital perspective. Thumbs up.